Facebook Messenger is a popular means of communicating, but the Mac doesn’t have a dedicated Facebook messaging app like the iPhone or Android does… or does it!?! Indeed, you can use Facebook Messenger to message friends from OS X, and in moments you can set up the Mac Messages app to function as a Facebook Messenger client in OS X. Using Facebook Messenger from the Mac is really quite simple, but it’s entirely separate from configuring Facebook sharing from the Mac, so if you have done one but not the other, you’d need to complete both to have the full Facebook functions of sharing, posting, and messaging available to you in OS X. 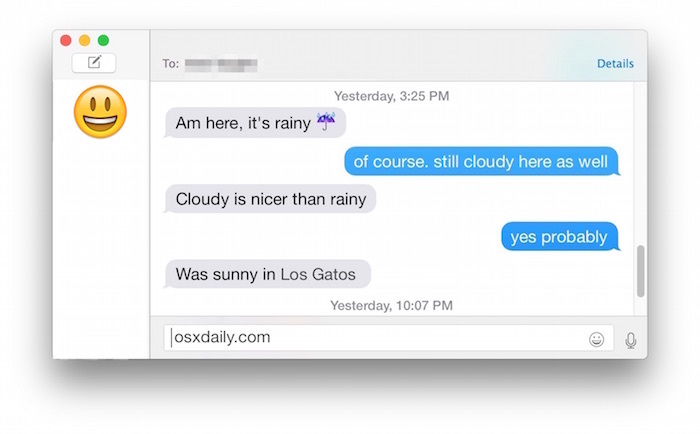 If you’re on a Mac, the ability to have Facebook Messenger conversations right in the Messages app of OS X is really quite nice, the conversations will appear alongside other text messages and iMessages, Google Chat, Yahoo Messenger, or AOL / AIM communications. Once you have Facebook Messenger added to Messages, you will be automatically logged into Facebook Messenger when the Messages app opens. To log out of Facebook Messenger in Messages, simply pull down the “Messages” menu item and choose “Log out of chat.facebook.com” – similarly, you can log in that way as well. You can access the Facebook Friends buddy list at any time from the “Windows” menu item in Messages app, where you can also set your status to be online or offline, or away. This certainly beats having a web browser window open to Facebook.com on a Mac, and if you have set up Facebook posts and sharing in OS X you now have much of the Facebook functionality right in OS X without having to go to the website to talk to friends, share stuff, or post status updates. 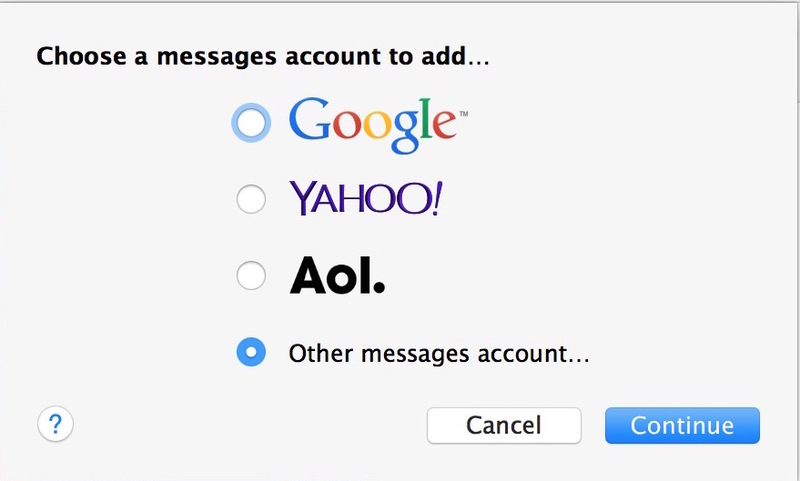 What if you don’t have Messages for OS X? 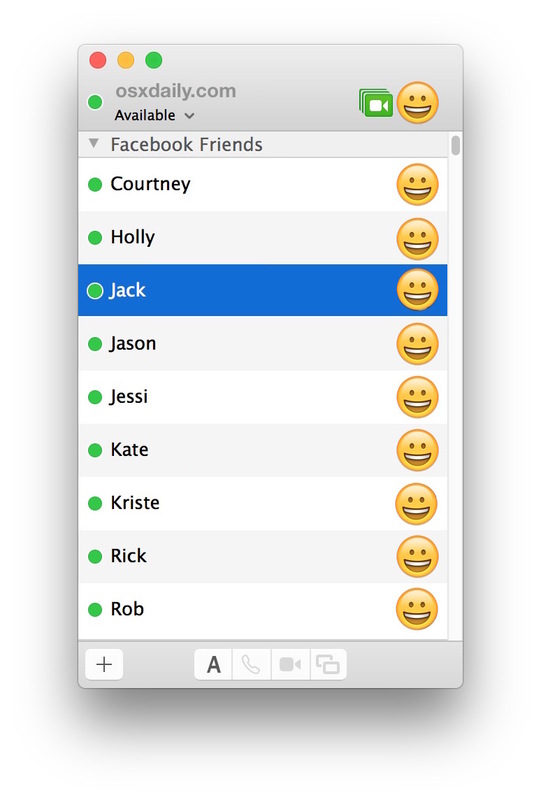 All modern Macs should, but if you’re using an older version of Mac system software that has the iChat app instead, don’t worry, you can also use Facebook chat in iChat too. The configuration and setup process is a little bit different, but the protocol is the same as is the ability to have a full conversation with your Facebook buddies. So, whatever your version of OS X on whatever your Mac, you’ll be Facebooking. Good for you. And no, if Facebook has been blocked on the network or hosts file, this will not bypass it. Isn’t this functionality going away on April 30? Facebook Messenger still works in Messages for me just fine I send Facebook messages through it all the time. It seems like it development was no longer ongoing and no longer supported but it still works fine for messaging on Facebook. hi. I think macOS Sierra broke the “Messenger” app… Can someone verify this? I just stumbled onto this thread, I’ve tried setting up the internet account in System Preferences and the Messenger app separately and it will not work…I’m running Sierra too. I’ve verified my username with FB and changed the password to ensure everything was set correctly. I tried the url username and the “m.me/” extension the iOS FB Messenger app shows in front of my username. Nothing works. Thanks for the update Doug. I followed the directions above and didn’t have the same success. I’m running messages Version 9.1 (5085). Which release of messages are you using? Wow what a bummer, I guess the web app or iOS app will have to do! Good tip, but there are some other (quite possibly, better) options too. Goofy is only for Yosemite, so thats a no no here. Glad I read the comments before I sat down to do this. I’m new to Mac and was surprised and slightly disappointed to see no Facebook/Instagram app support. This did not work for me. My phone is broken right now and I can’t send SMS messages to my friends with android products, to use SMS I would have to have my phone with me so using Facebook messages is necessary for me. Still works nicely as far as I can see. Contrary to previous comments, FB hasn’t closed this portal down. It still works as of May 10th. This doesn’t work (anymore?). Connection unexpectedly closed, please try again later. As mentioned above, facebook have removed this functionality. Nice that I don’t have to have FB open in a browser to use messenger. Thanks! these both work for mac? and you can get yourself apps out @app store like “chat for facebook”, and those work all great? Just a heads up that FB has appeared to have shut off their XMPP access so they’ve officially closed all their 3rd party access points. July 16 here … still works. Agreed, just tried it out today as well. Works fine. Thank goodness, less tabs on my browser. Still working here too! :) It’s August now and I’m connected just fine. It’s 6th August and it’s still working. Yoo hoo! It’s August 12th here, and it doesn’t work for me. Kept saying I got the wrong username and password, but I am able to login from the web using the same username and password. For all u guys that say that messenger does not work it still does, we use it at work as our comm platform, if it’s not working check your settings. Cheers! What do you mean you have to activate chat on the facebook interface? Go to the Facebook website, you should see your Facebook friends on the right. Enable chat by pressing the options button at the bottom, and click “Turn on chat”. Worked for me, buddies appeared in iMessage. October 15th and and it works fine. It does work. Check again if you already have installed facebook on your notification centre, which is apparently a requirement. It stopped working for me in the beginning of December :(. It’s December 7th and it hasn’t worked in a few weeks. It says my login and password are incorrect. Bummer! Sometimes I wonder why I’m still on facebook as it’s just ads and garbage. Facebook Messenger continues to work in Messages regardless of the date, but yes Facebook itself is a load of rubbish that cultivates narcissism, ADHD, loathing, jealousy, and unhappiness. Nobody should use it. It does not work for me since the begin of December. Not working anymore… Any solution? This no longer works since Facebook shutdown it’s chat API. You may want to update this post. Stopped working for me earlier this week. On April 30, 2014, we announced the deprecation of the XMPP Chat API as part of the release of Platform API v2.0. After April 30th, 2015 apps will no longer be able to access the service or API. 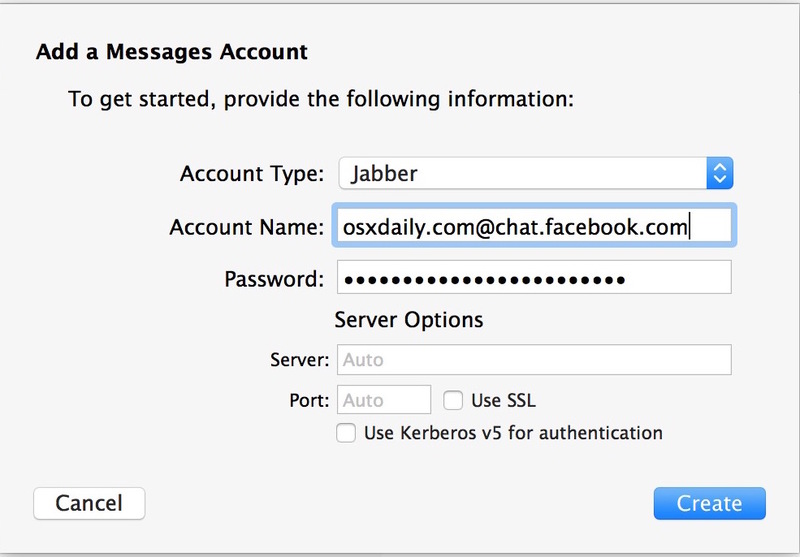 This includes both access to chat.facebook.com and the xmpp_login permission. 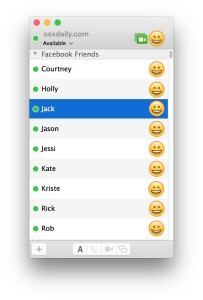 We recommend people access Facebook Messages on the desktop via Facebook.com or Messenger.com. Not working since December 2015, Any solution? Stopped working for me today. RIP to easy Facebooking. Chat stopped working on Dec 21st 2015. I get wrong username/password message. Stopped working fro me this month as well. Anybody got a solution as this was really useful for me. You might want to update your readers this is now broken as facebook disabled XMPP usesage in early 2015. If there is a work around I’d love to know it. What a shame… Well, it was nice when it lasted! Since Messages App on Mac doesn’t connect to FB Messenger anymore, I’ve been using http://www.messenger.com and it’s working just fine! I can talk to the right people without having my attention disturbed by the ever-changing timeline! Unfortunately this is not working any more. Facebook messenger still works in Mac Messages app if you already have it in there, if you try to load a new account it doesn’t always work. Tried this and it doesn’t work. Says my username or password is incorrect but they’re not. I followed the above instructions to add fb Messenger to my Macbook pro. Then I logged out, but I forgot to record my password. Now I can’t get back into fb messenger and I see no option for resetting the password. Big price for a small perk. Holy Toledo! The installation app closed Safari, and when it reopened it, it did not restore my previous session! All of my open tabs … GONE! Safari’s history only keeps track of recent pages opened, so if you have several windows with multiple tabs, you’re screwed! Delete this page if it no longer works. Or at least put a comment at the top of the page so people don’t need to read all of the posts. My version on the Mac has no spot on the dropdown to “add an account” like messenger. What’s uP?